One of the biggest obstacles to SMS marketing list sign-up is the cumbersome, multi-step process that consumers must endure with many of today’s text marketing solutions. SmartJoin changes that, with an intuitive, streamlined experience that makes it easy for consumers to sign up from their phones – no matter their location. Our emphasis on user experience is the key to SmartJoin’s industry-leading 90% sign-up completion rate. For years, SMS marketers have been content to gather as many phone numbers as possible, without regard to building quality contact records behind the phone numbers. The process was straightforward; text a keyword and get added to the list. This made sign-ups easy, for consumers, marketers got lots of phone numbers but, again, without regard to list quality. With SmartJoin, marketers are quickly growing their SMS marketing lists with an emphasis, not only on quantity, but list quality. The key is SmartJoin’s unique ability to shorten the opt-in process when collecting demographic information. 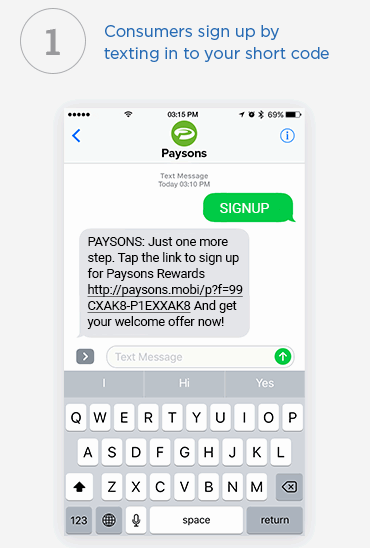 Once an opt-in request is sent by a consumer, a text is returned with a link to a sign-up page, which has the consumer’s number pre-populated where marketers can collect name and address – and even other info. A simple form submit completes the double opt-in process. The information gathered during sign-up can be added to a CRM system to give marketers more data on each subscriber, resulting in a higher quality list that is far superior to a mere phone number. And with SmartJoin, retailers achieve a 90% SMS list sign-up completion rate. 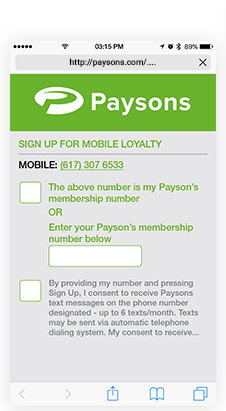 Great SMS marketing begins with getting consumers to sign up – in large numbers and with accurate information. Data captured on the SmartJoin form is completely customizable to meet your precise list capture requirements. You can tailor the sign-up form to collect any information – from just a mobile phone number, to a complete CRM record – with minimal IT involvement. 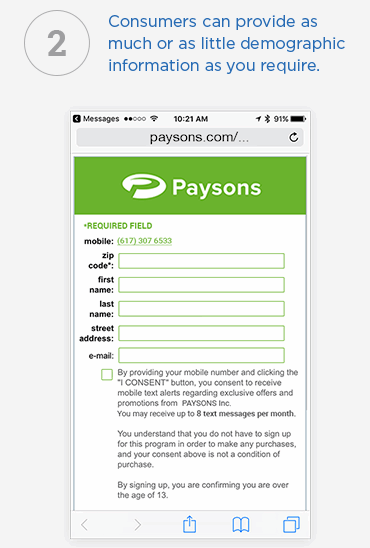 Using unique keywords to attribute SMS list sign-ups to individual stores can be cumbersome, and becomes even more difficult when your promotional signs need to change. Instead, you can use SmartJoin’s Assign Origin feature to automatically know the store in which a customer signs up. This lets you give credit to the store that drove the sign-up, making it an effective tool for incentivizing stores to promote more sign-ups. With SmartJoin’s Favorite Store Assignment, you can assign customers to a favorite store automatically using zip code, GPS or other store identifier, giving you the ability to send localized messages for events and offers to drive higher engagement. And, best of all, you can use Assign Origin and Favorite Store together, so you can give credit to the store that completed the sign-up and send localized messaging based upon where the customer lives or works. All of this happens transparently, without the customer having to enter any data and it makes managing your call-to-action signs easy! SmartJoin automatically populates the SMS marketing list sign-up form with the consumer’s mobile phone number, and recognizes that consumer if he or she tries to sign up multiple times in an attempt to get multiple welcome offers. This means that even if the consumer unsubscribes and then re-subscribes, SmartJoin recognizes the phone number, and the corresponding CRM or loyalty record. This ensures that consumers receive and redeem a welcome offer only once, and receive only one loyalty number — and ensures that marketers do not end up having multiple records for the same individual. With SmartJoin, you never have duplicate sign-ups. 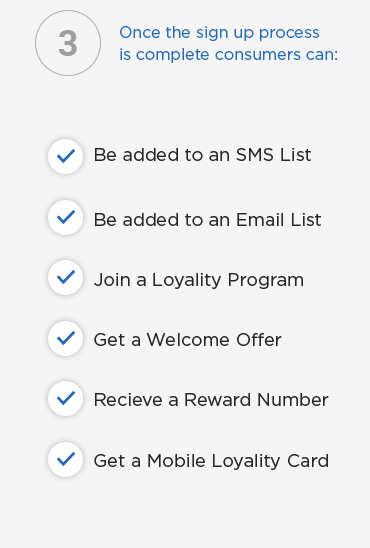 SmartJoin is Intelligent SMS Subscriber List Sign-Up – with innovative features that give you the power you need for growing SMS subscribers and sophisticated mobile and online marketing programs. 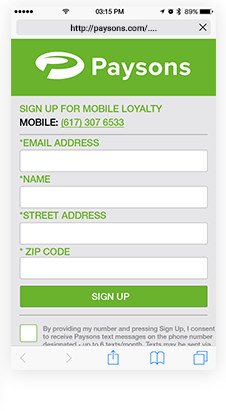 Learn how to put SmartJoin SMS list sign up to work for your marketing programs. Contact CodeBroker today to schedule a SmartJoin demo.